Why are Accident Engineering Reports Incomplete And/ Or Misleading? From my experience as an accident engineer, there are several reasons engineering and accident reconstruction reports are problematic. Let’s address the first and biggest issue, cost. Many attorneys don’t realize the true value of cases because they deal with doctors who often doesn’t know how to document the patient’s injuries properly, then there are the Colossus issues that most also do not handle in their documentation. This is a huge advantage to the insurance company who have banked on the sloppiness and ignorance of the entire medical-legal community. However, there is a growing number of doctors and attorneys who do know. If you’re reading this and should follow Dr. Mark Studin teachings, you have an advantage over most of the industry as you also know how those insurance algorithms are used to devalue a case and how documentation on your part as a doctor is critical in refuting it. In this sense, the insurance company knows they will pay, a majority of the time, a minimal amount for a collision even if the case should have a much higher value due to the nature of the injuries. The insurance companies know this for several reasons, but the biggest reason is cost, not for them but you. For the sake of discussion let’s say the average case settles for $15,000. If the collision specialist costs $2,000 to $5,000 (in addition to the doctors and the other specialists), this is an expense which cannot or chooses not to be absorbed by solo attorney’s, smaller and even larger legal firms. The insurance company knows this and use it whenever it presents itself. Why can a “deep pocketed” insurance company afford to pay a specialist on a smaller case? There are few reasons but the two biggest are the insurance companies can absorb the cost of a smaller cases AND the consultants will do the work, in some cases, pro bono, as good faith towards the client to get more cases. Obviously, if the attorney cannot make any money they will not take the case and paying for a collision professional is a significant factor in this decision, especially if the defense already has one. If you, the doctor, are also the collision expert, this greatly reduces the attorney’s costs per case while making you more valuable as a resource AND affords the attorney the opportunity to take on more cases. The cost concerns lead to a second problem, identifying inaccuracies. I have yet to meet an accident engineering defense specialist who will explain the shortfall of a case because it will expose their inaccuracies and will not bode well for them regarding future referrals. MANY low speed collisions have gaps which must be filled in with vetted data and very carefully chosen. The use of generalized data (which is the norm in the industry to use) is very dangerous as it makes the gap for results reliability too wide. The results will have too much margin for error and that margin of error is often the difference between prevailing or being on the losing side and all too often accepted as accurate, but is not. In this section we discuss why time is a critical factor. In the picture above, we illustrate a train, which collides with a barrier at 100 miles per hour and crushes. 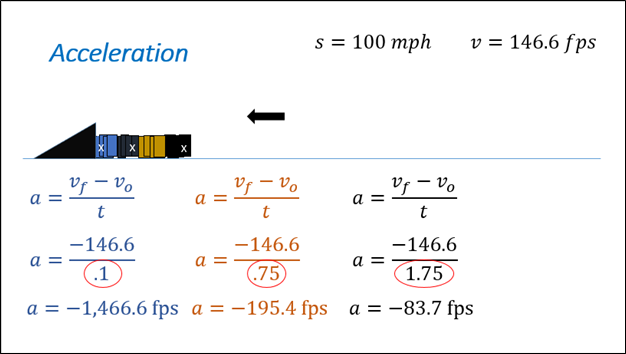 The associated math demonstrates how increasing the time decreases acceleration (see circled numbers). In this example, there is no room for doubt regarding injury as its speed and acceleration is well beyond accepted thresholds. What if we change the speeds so they are very close to those injury thresholds? Consider the second example, here the speed of the train represents final approach to a stop barrier where the engineer is a little careless and bumps the stop barrier. What is important to note about this visual is the time. If we double the time (from .05 to .1) the final g force is halved (resulting in 2.267 g’s). What if there were studies we could cite which say the time needed for a train to final stop is .075 seconds? The first time value of .05 would be too short, the second value of .1 would be too big, and both don’t fit the cited studies. 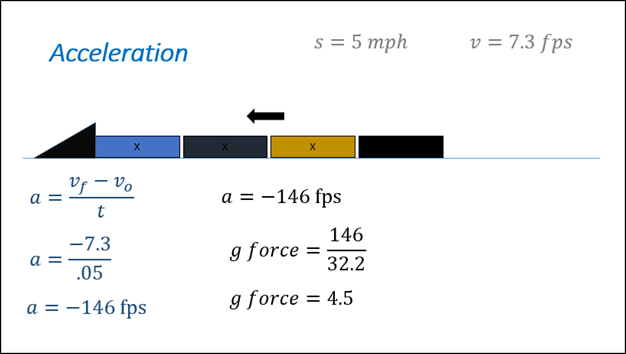 In this example the time variable changes a very small amount but the resulting change in the g forces may no longer be enough to substantiate a claim for injury. This is why the justification for any values assigned is so important. If you don’t know why the variables are there and why or how they were chosen, they you don’t know if they are accurate or not. A small deviation is often the arbiter for success or failure in a case in determining if there were sufficient transference of forces required for bodily injury. Cost and inaccuracies are two of the problems commonly faced by attorneys regarding collision reconstruction. For doctors, there is now a recognized course [CLICK HERE] to give you the training to be an accident engineer/reconstructionist and for the lawyer, when there is a defense engineer, you MUST have someone dissecting the math to ensure accuracy because usually the “guestimates” used will work against you in settlement or litigation.